LiftLaws.com - Are Beadlocks Street Legal? Are Beadlock Wheels Street Legal? State and federal laws and agencies do not approve equipment, they can only prohibit the use or the modification of equipment. The US Department of Transportation (USDOT), through the National Highway Traffic Safety Administration (NHTSA) sets the safety standards for automobile equipment. Currently, there are no government mandated performance requirements for wheels. There are, however, requirements for dimensions and markings. The Society of Automotive Engineers (SAE) created the SAE J2530 Aftermarket Wheel Performance Requirements and Test Procedures which have been adopted by the industry. Traditional style beadlocks, where a bolt-on ring clamps the tire's outside bead to the rim are not compliant with SAE J2530. 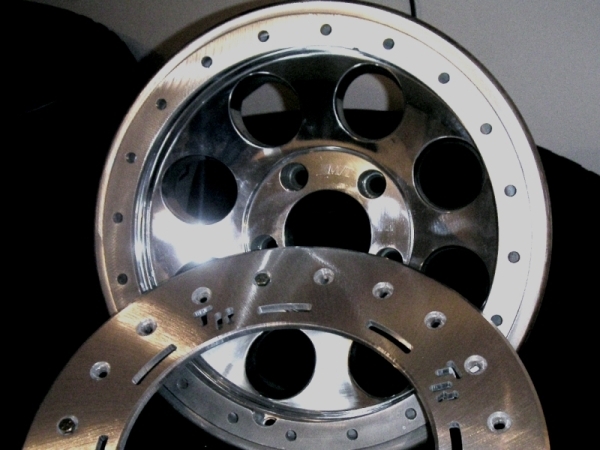 For liability reasons, wheel manufacturers do not sell wheels intended for use on public roads and highways that are not SAE J2530 compliant (even if they may be DOT compliant). Beadlock manufacturers sell their non-compliant wheels as "For Off-Road Use Only" or "Not Legal for Highway Use" and in some cases they even mark their product as such. If a product is sold as "For Off-Road Use Only" or "Not Legal For Highway Use" is it illegal for the customer to install them on a street driven vehicle? When a manufacturer states that a product is "Not Legal For Highway Use" it means that the product does not meet DOT or SAE standards. It is also their legal way of saying that they are not liable for the misuse of their product. Their statements do not mean that beadlocks are illegal to drive on the street as that can only be determined by state and federal laws. In creating LiftLaws.com we went through the street legal laws of each state and not a single one references beadlocks. In fact, most state's laws don't mention wheels at all and those that do only require that the wheels be safe. Many states have a "catch-all" clause that requires vehicles driven on public streets and highways to be in safe operating condition. Several states even reference DOT, NHTSA, and SAE standards as safety guidelines. Beadlocks fall in a catergory of being not-illegal. Generally, equipment like this only becomes illegal after it is found to be the cause of accidents. *It is important to note that just because something is not-illegal that does not necesarily make it legal. Now that beadlocks appear to be not-illegal, we need to look at the potential consequences of driving a vehicle equipped with beadlock wheels. Similar to other street-legal equipment laws, the risks are primarily fix-it tickets and lawsuits. The chances of being issued a fix-it ticket for beadlocks is almost nonexistent. A) Only a close look with a trained eye can spot a real beadlock over a lookalike. B) Most police officers don't know what beadlocks are. C) Most police officers don't know if beadlocks are illegal or not. D) Police officers are hesitant to write tickets for things they are not sure are unlawful. A fix-it ticket is a minor inconvenience since it can either be argued in court or satisfied by removing the beadlocks from the vehicle and passing a tech inspection. The worst possible scenario is having a beadlock fail on the road resulting in a severe accident. Lawyers for an injured party will inspect the vehicle for aftermarket parts and equipment modifications to build their case against the driver. The best defense in the event of an accident is a solid insurance company and insurance policy. Anytime modifications are made to a vehicle they should be brought to the attention of the insurance company to make sure that insurance coverage remains in full effect. $100 LIFTLAWS.COM BOUNTY - Anyone that provides us with documentation that shows that beadlocks are illegal in any state or sends us a copy of a fix-it ticket they received for their beadlocks will have $100 donated to the BlueRibbon Coalition in their name.